Password is one of the things one has to take care about, while speaking about the security of an account in any online profile or website. When creating an account, you don’t care much about the password as you are more inclined towards using the account and registering to it as fast as you can. But if the password is not strong enough, and is guessable, the account is under major risk of hacking. If possible, try to have around 14 characters, or at least 8 characters in the password. Diversify your choice of characters to all keys on keyboard, and not just the ones you use frequently. Combine everything like alphabets, numbers, symbols etc. Create a password that is easy to remember but hard to guess by anyone. Think of a small phrase that you can easily recall. 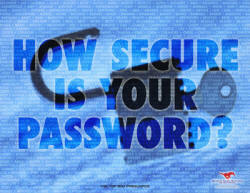 Try to keep changing the password regularly, with related phrases so that you can easily remember them. Try to avoid the words that are in the dictionary, as they are the most guessed ones. Don’t include your personal information like name, birth date etc. in the password. Don’t write down your password, or store it anywhere. If its really hard to remember, try to change it to a little easier one. Don’t use the same password for all your accounts. If you want to save your passwords, there are password encryption softwares available. Use them and encrypt, and then store your passwords in your computer. Never share your passwords in chats, or through emails. Don’t use sequential numbers or alphabets, or a line of keys in the keyboard for your password. Microsoft also has a password checker tool which can let you know how strong your password is, but you totally should not depend on it. It shows just how strong the password is, but saving it and protecting it is your own duty. Also, there are many other sites that provide similar tools for checking password strength, I suggest not to use them as they can be saving your passwords. The tool by Microsoft is trustworthy and good one to check. Always use a mix of characters. Numbers, Caps & Special characters. Security is the major concern in these days. That sounds so simple yet is so hard to do! I have SO many passwords and recently have started to put thought into a more automated way of dealing with them. I enjoyed the post and the suggestions and I subscribed to learn more. Very frustrating subject for me so this is very timely. I am in currently in a coaching course. Sadly four of the students have been the victims of hacking. I wonder had they read your site all of them may not have gone down? Thank you very much for that useful information. Pretty good list of precautions there. I always use a complex password that has both alphabets and numerics, which are separated by a space bar. This makes the password very hard to remember too, so I have a password saving and managing tool which keeps all the password info and I don’t have to write it down elsewhere. I’ve read the part where you stated not to write down your password. It just happened that my wife’s brother was a bit cautious on how to remember his emails and online information and asked his wife if she could write them down for him. Funny, ey? Anyway, one more thing about password, always clean your browser everytime you logout if you’re sharing computer with co-workers or if you’re using a public computer.